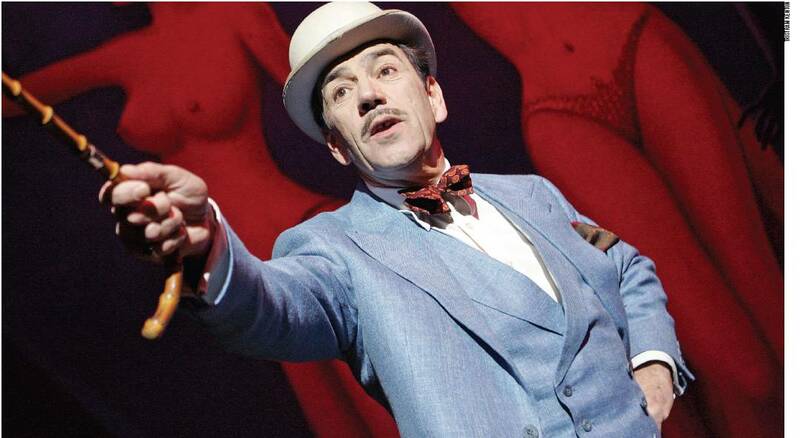 LONDON – The shadow of Laurence Olivier’s performance as Archie Rice looms so large over John Osborne’s 1956 play “The Entertainer” that it’s almost surprising to rediscover what a sturdy piece of work it is. Robert Lindsay, a big name in British film and theater, takes the role in the Old Vic’s revival of the play, but director Sean Holmes makes him much more a part of the ensemble than occupant of his own spotlight. The result pares down the scabrous nature of Archie’s camp personality but makes the character considerably more human. Olivier’s choice of the role of the uncouth, untalented and downright obnoxious music-hall entertainer gave a turbo charge to the great man’s fading career and also helped fuel the change in British theatre and film from depictions of staid middle-class drawing rooms to vulgar, not to say squalid, working-class kitchens. Set at a time when Britain was making one of its periodic and catastrophic military forays into the Middle East, the play sees the country itself as a decaying music hall, filled with old delusions of grandeur, rampant prejudice and disdain for the poor and foreign. Lacking the talent of his forebears, including his father Billy (John Normington), who was a gifted performer, Archie delivers rancid jokes, off-key ditties and clumsy soft-shoe numbers to bored seaside audiences who are only in the theater to see the statuesque but motionless naked women. The play alternates between scenes of Rice’s performances onstage and his equally pathetic lies and affectations in the company of his unhappy family. Having not paid income tax for 20 years, Archie fears every knock on the door but still imagines that his latest 20-year-old flame will be waiting for him if he dumps Phoebe. His wife frets over the fate of their son Mick, who is serving in the army that has just invaded Suez, while Jean has called off her engagement because her young man didn’t like her joining a Trafalgar Square protest demonstration. There are slight problems with this production. Designer Anthony Lamble’s set is unconvincing with a backdrop of three giant nudes for Archie’s set-pieces, and Lindsay is just too good a song-and-dance man (see Carl Reiner’s 1989 “Bert Rigby, You’re a Fool”) to be convincing as someone with no talent at all. But Lindsay makes a shrewd choice in not emulating the way Olivier went for the jugular with Archie’s merciless sarcasm. Ferris plays the neglected and not very bright wife with great compassion, and Normington is a delight as the doddering and nostalgic old music-hall player. All the elements in the play are eerily topical, and while the British Empire is long gone, the current fears over incompetent political leaders and crumbling institutions make “The Entertainer” thoroughly pertinent. Vnue: The Old Vic; Cast: Robert Lindsay; Pam Ferris; Emma Cunniffe; John Normington; David Dawson; Lindsey Lennon; Jim Creighton; Brother Bill: Andrew McDonald; Playwright: John Osborne; Director: Sean Holmes; Designer: Anthony Lamble; Lighting designer: Peter Mumford; Music: John Addison; Choreography: Paul Harris; Sound designer: Fergus O’Hare. This review appeared in The Hollywood Reporter and Reuters. This entry was posted in Reviews, Theatre and tagged 'The Entertainer', John Osborne, Laurence Olivier, Robert Lindsay, Sean Holmes, The Old Vic. Bookmark the permalink.